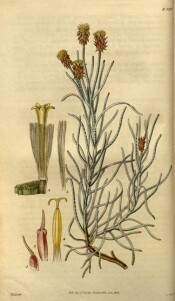 Hortus Camdenensis | Helipterum gnaphaloides DC. Half hardy sub-shrub with a many-branched stem, linear leaves, to 6cm long, and many daisy-like flowers with yellow florets. To 50cm. [RHSD]. ‘The only knowledge we have of the cultivated state of this plant, is derived from the Royal gardens at Kew, in which inestimable collection it flowered in the month of June, 1826. From an excellent drawing then made, and in the possession of W. T. Aiton, Esq. the annexed figure was made. 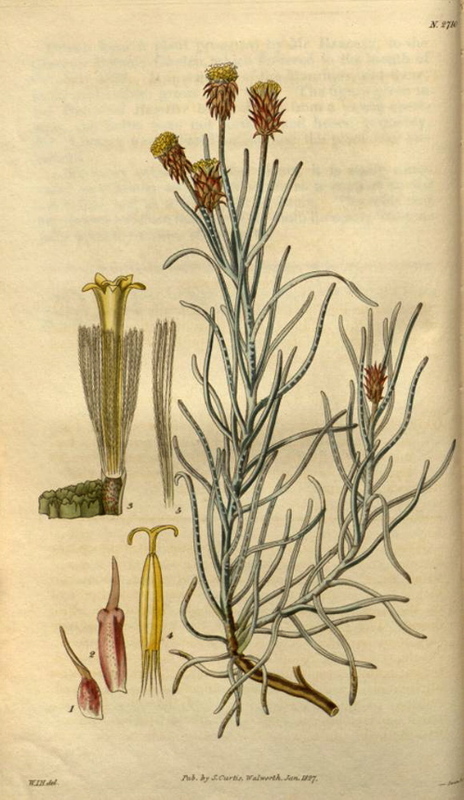 The seeds were sent, in 1824, from the Cape of Good Hope, by Mr. Bowie, who was long and most advantageously employed in collecting plants in the interior of Southern Africa, at the government’s expence. Every friend to Science must regret that this indefatigable naturalist, after sending the greatest treasures, both of living and dried plants to the Royal gardens, and, in the midst of his usefulness, has, by a needless stretch of parsimony, been recalled.’ [BM t.2710/1827]. Listed in the 1850 and 1857 catalogues [H.108/1850].